Sold by TEKXYZ and Fulfilled by Amazon. Gift-wrap available. PRACTICE ANYTIME and ANYWHERE - You don't have to go to a gym, strap the headband on, have fun and burn your body within 15-20 minutes! 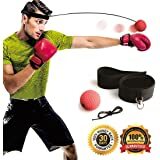 Perfect for work breaks or school breaks or even for the beach and the park, this focus punching bag will burn many calories and help you get fit! Sold by TEKXYZ and ships from Amazon Fulfillment. Sold by ORTID LLC and ships from Amazon Fulfillment. Sold by Sanabul and ships from Amazon Fulfillment. 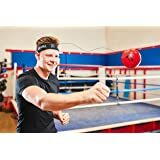 Boxing Reflex Punching Fight Ball + Jump Rope Boxing Equipment Training Set. MMA Equipment. for Fitness, Speed, Agility, Skill and Fun. 1 Size fits All Lightweight Headband for Kids and Adults. A LOT easier to watch than to actually do it. Love the challenge and the guys I train and myself will definitely benefit from using this product. Great addition to my boxing gear! It's a little difficult to get used to at first, but as long as you start with the black ball, and start with small punches, (think tapping it with your fists) until you get the rhythm, you should progress quickly. After just under a week, I've progressed to the red ball. The headband adjusts well, it fits me without issue and I have a pretty large head. The material for the balls is soft and spongy so while it can come back and hit you, it's soft enough that it doesn't hurt. 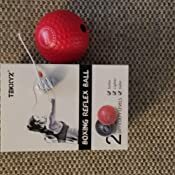 I happened to see the reflex balls when searching items related to boxing for my son who is a boxing fan. When telling him about it, he said he would like to give it a try... Long story short, he likes it a lot since he received it. Bought several for me, the grandkids and for my students. Everyone that tries it enjoys it. Easy for kids to use and practice their hand-eye coordination for any sport. 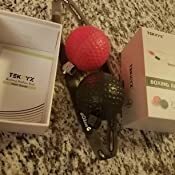 I purchased the Boxing Reflex Ball for my father who had a stroke last year. He is really working on his reflexes and really enjoys the speed bag (?) and I happened to come across your product when I was looking for a "reflex ball"(lop-sided tennis ball thingy)...Anyway, He loves it! He is getting pretty good! Thanks. Don't use it close to a fan! 5.0 out of 5 starsGreat addition to my boxing gear! Love this set up! It's a little difficult to get used to at first, but as long as you start with the black ball, and start with small punches, (think tapping it with your fists) until you get the rhythm, you should progress quickly. After just under a week, I've progressed to the red ball. The headband adjusts well, it fits me without issue and I have a pretty large head. The material for the balls is soft and spongy so while it can come back and hit you, it's soft enough that it doesn't hurt. 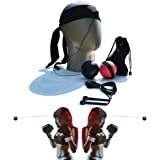 You can probably make something similar for a few dollars less with a tennis ball, some elastic string, and either a headband or a hat of some kind, but for the time and money you'd invest, and for the material of the balls in the set, with the ability to increase the difficulty level I would recommend spending the few extra dollars on this set up, especially for beginners. 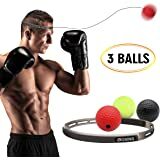 5.0 out of 5 starsHigh quality reflex punching balls -- and so inexpensive! Are you kidding me? I still can't believe that this product is better made than my other far more expensive boxing reflex balls! And talk about fast shipping? It arrived at my home within 35 hours after ordering, and it was just a standard order! Now that's fast service! I particularly like the two-tiered system of difficulty level that this TEKXYZ product offers. 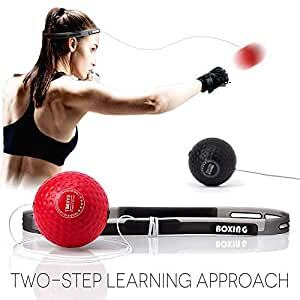 Both punching balls appear to be the same size and weight (very light and soft for user safety), but the string on the black ball seems to have less tension than the red ball string does. The black ball is great for beginners. It allows you more reaction time to see the ball coming at you once you've punched it. And the headband quality is excellent (very comfortable Velcro head size adjustment). 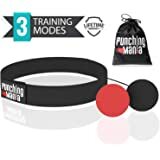 I've got a lot of experience with kicking and punching apparatus, so trust me on this one: don't waste your money on a more expensive brand. You don't always get what you pay for. Occasionally, you get lucky and pay much less for what you get. And in my opinion, TEKXYZ is the diamond-in-the-ruff of reflex punching ball kits. Note* I am not paid or compensated in any way by TEKXYZ or any affiliated companies for this objective review. 5.0 out of 5 starsGreat tool no just for boxing. In a few words , the best purchase I did. I love boxing and my mayor problem is have a punching bag in my apartment, I don’t want to make big noise to my neighbors... I find this and is incredible. More focus after practice often and conteo de ball. I recommend to my clients in special my senior clients to improve their reflex and balance. This item is fun to use and is an easy way to incorporate slight exercise into your day while watching tv! However, I think the manufacturer of the product can really improve on their quality control. Out of the two balls included in the set, the one that is for begginers arrived already detached/broken from the ball. 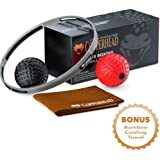 This was a bummer because I’ve never used one of these boxing headbands before and needed the beginner ball. 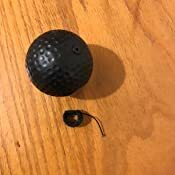 I tried to tie the broken end to the rest of the elastic string in order to fix it, but this just makes the ball bounce back at unpredictable angles due to the uneven tension. 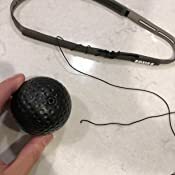 Also, since now there is only one end of the string attached to the ball, it doesn’t leave much of a safeguard if that one were to also break... the ball would just go hurdling through the air away from me and probably break something. The concept of this product is really fun, but due to the flimsy quality of this specific version of the product, I would not recommend it. I will probably purchase a different brand’s item in the future. I was skeptical, but quickly came to love this thing. It takes a few sessions to get the hang of it, but then you'll find you can easily hit the (black) ball twenty or more times in succession. (No gloves needed, BTW.) You'll even instinctively pop-pop using the same fist when called for. 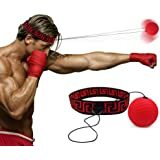 Beware the red ball, however -- it's elastic string is much firmer and you'll need a real boxer's reflexes to do well with it. Well, you have to buy this knowing that it’s basically a cat toy. You’re not going to become the next Money Mayweather after spending a week tapping the ball. But honestly it’s pretty fun, so make of that what you will. Bottom line: pretty fun, buy it if you have money sitting around to throw at something!